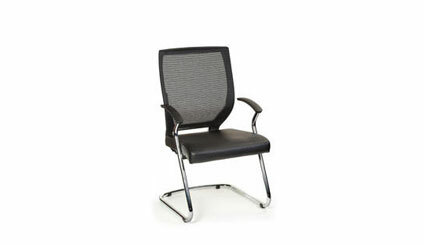 ART DESIGN INTERNATIONAL MALLA SIDE OFFICE CHAIR ON SLED BASE|ADI| Alliance Interiors Inc. The Malla side chairs are available in a variety of regular and recycled fabrics, PVC free synthetic leather or in vinyl. They are offered with Low or High backs with or without fixed armrests. Three bases are available: sled, cantilever and four legs on casters. Left and right retractable writing tablet arms in grey or black laminate can be installed. Metal finishes for arms and bases are available in black and chrome. This mesh back side chair works in any area in your office where comfort, esthetics, affordability and functionality are a priority. The Malla side chair works well with the Malla ergonomic mesh back task chair. The mesh supports the lumbar area of the back while the suspension system in the seat distributes the body weight evenly. This makes for a very comfortable sit for long periods of time. These chairs can be used in home offices, private offices, meeting rooms, waiting rooms and just about anywhere where comfortable side chairs are called for.